Christopher Hacker | The PHOENIX Demonstrators marched from Federal Plaza to the Chicago River, just outside the Trump International Hotel and Tower. 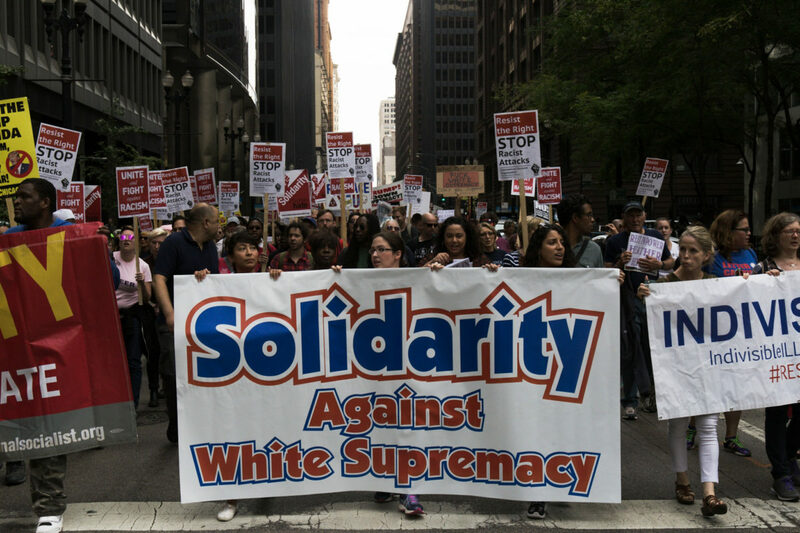 Chicago responding to the racial violence in Charlottesville, Virginia, organizers estimated close to 1,500 demonstrators gathered downtown to protest white supremacy Sunday. The demonstrators called for solidarity with activists in Berkeley, California and San Francisco, where a group called “Patriot Prayer” had planned to hold two so-called “free speech” rallies. Both rallies were cancelled over safety concerns after thousands of counter-protesters, including often violent anti-fascists or “antifa,” marched in opposition. Demonstrators met around 2 p.m. at Federal Plaza Aug. 27, where speakers called for action against racism and white supremacy. Some demonstrators held signs in honor of Heather Heyer, the 32-year-old Charlottesville native killed when 20-year-old James Alex Fields of Ohio allegedly drove his car into a crowd of counter-protesters. Shadia Daniels, a high school science teacher, said the recent events in Charlottesville left her concerned for her students and family. She said she attended the demonstration because she wanted to stand up for issues that would impact her community. Brian Sabath, a first-year student at Loyola, said he attended the demonstration because he felt anti-racist rhetoric needed to be voiced. For Jordan Scherer, a recent graduate from Northwestern University, efforts against Trump’s presidency go beyond the Sunday demonstration. Jenna Leahy, a first-year business marketing student at Loyola, also marched with demonstrators in the rally. She expressed disdain for the apparent resurgence of white supremacy in America, but said that by taking action, she feels that she can make a difference. “Civil rights are human rights and women’s rights are human rights and gay rights are human rights and trans rights are human rights,” Leahy said. Additional reporting by Tori Roberts and Lexi Taylor.